Start the day with a handful of fresh vegetables, bursting with zingy herbs, and you'll have a head start on meeting your daily two and five. Mike McEnearney, of Sydney's No. 1 Bent Street, makes a virtuous-sounding breakfast absolutely delicious by mixing up the textures and flavours. Place the grated vegetables, alfalfa sprouts and all of the herbs except the coriander in a large bowl and toss together. Season with salt and pepper, then dress with lemon juice and olive oil. Heat a heavy based frypan over medium heat and toast the cumin seeds until aromatic, then transfer to a mortar and coarsely crush with the pestle. Add the quinoa to the frying pan and toast until it smells nutty and starts to pop, then stir into the crushed cumin. Bring a deep narrow pan of water to the boil (I find the deeper the pan, the better the poached egg, as the egg grows a tail as it cooks and assumes a lovely ghost-like form), then add 1 one teaspoon of vinegar and two teaspoons of salt per litre of water. Crack each egg into a cup. Turn the heat down so the water is just simmering, then stir the water in one direction to form a vortex. Slip the eggs, one at a time, into the vortex and allow to slowly circle down to the bottom of the pan. The eggs will float to the top when they are ready, about two minutes. A perfectly poached egg should feel like a balloon – soft but resilient. Remove from the pan and drain on paper towel. 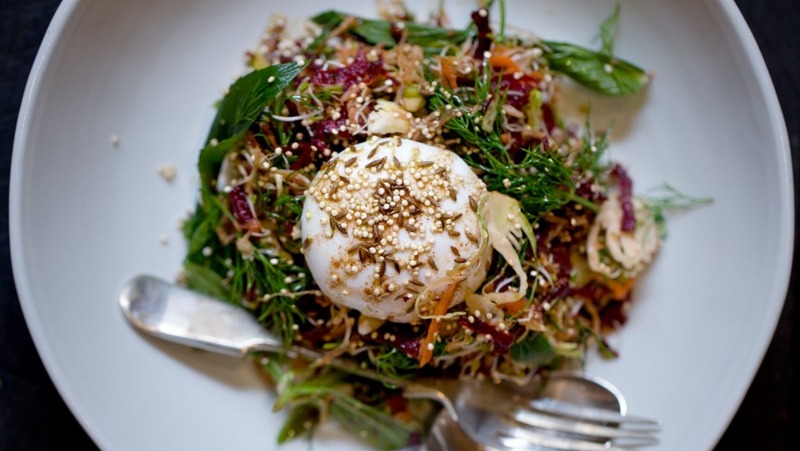 Divide the grated vegetable and herb mixture among four bowls and place a warm poached egg on top of each one. Season the egg with salt, scatter with the toasted cumin and quinoa, then drizzle with a little extra olive oil and serve immediately.